The church at Santiam and Main was built in 1892. It’s a good thing Albany did not buy the Cumberland Presbyterian Church at 401 Main Street as an investment. 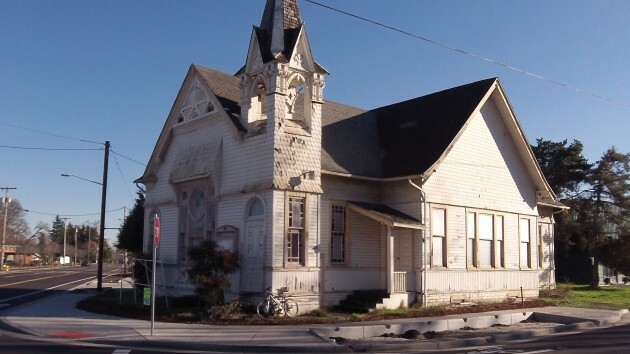 The city purchased the property for $150,000 in 2000 for a street project, declared it surplus last year, and now may give it away to be restored as a faith-based counseling center. As reported here on Jan. 1, the city received two proposals from would-be purchasers. The city staff now is recommending that the council move forward with Good Samaritan Ministries Albany, which would like to buy the building for $111, restore it with donations and grants over the next few years, and use it for counseling and good works in the neighborhood as their name implies. The other offer came from Randy Durig, identified in a staff report as the owner of several businesses in Tigard, who would pay $16,500 for the building and renovate it — at a cost he estimated at $244,080 — and then lease it to a congregation and make it otherwise available for rent. The city council will consider the staff recommendation at a work session starting at 4 p.m. Monday at City Hall. Good Samaritan Ministries Albany has about 30 members who volunteer to help people in need with counseling or practical kinds of assistance, according to Catherine Williams, the group’s director. A retired registered nurse, she told me she attended five years of weekly training sessions at Good Samaritan Ministries’ headquarters in Beaverton. The nonprofit organization also has branches overseas. “The mission is empowering Samaritan workers by the Christian gospel to reach out in compassion to help those in crisis within the community,” Williams explained in a letter to the city. The letter accompanied a detailed description of the group’s plan for fixing up the building for an estimated $157,700. They hope to get donations of money and materials, and they pledge they’ll spend 20 percent of their membership donations on the building. They would seek no help from CARA, the downtown urban renewal district. One of the group’s volunteers would manage the restoration. She is Linda Dodson, a former fundraiser and coordinator for the Corvallis Boys and Girls Club who also oversaw the renovation of a historic Corvallis house and the Lewisburg Grange Hall. I am excited to learn of the possible use of the Cumberland Presbyterian Church by Good Samaritan Ministries for counseling and helping people in the community. Having been associated with Good Samaritan Ministries in their Beaverton Headquarters office for 18 years, I can vouch for the hundreds, if not thousands of lives positively impacted by this organization. My role as in intern counselor and later a clinical supervisor for graduate interns and licensure interns provided an opportunity to observe and participate in the work accomplished by people dedicated to make a difference in the lives of others. It is my desire and hope that Good Samaritan Ministries will have this opportunity in Albany to provide the means for healing and restoration of many people, enriching the lives of the individuals, families and entire communities.